Use this snap-on comb with clipper for smooth, even results. Combs are clearly marked for easy size identification. 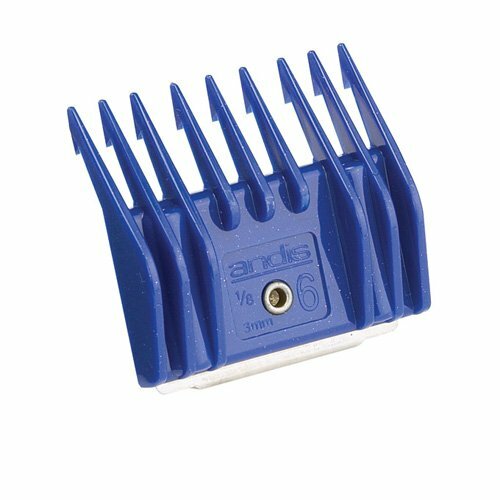 Ensure uniform coat length when clipping with Andis large universal snap-on combs. smooth, High Quality Plastic combs glide smoothly through coats, helping you achieve great results. For best results, use Andis Universal snap-on combs with #40, #35, #30, or #10 blades. Fits Andis, Conair, Master Grooming Tools, Oster and Wahl detachable style blades. Fits A5 compatible clippers. Available in 6 size, 1/8-inch cut, 3-millimeter. Measures 4-4/5-inch length by 3-inch width by 1-inch height.